Former Gladstone Gladiator and Commonwealth Games 4 x 100 M Freestyle Relay Gold Medallist Jack Cartwright has resumed training in preparation for the Pan Pacific Championships in Tokyo in August. And ultimately if his recent amazing form holds, the next goal for the hard-working sprint champion is selection for the Tokyo Olympics in 2020. 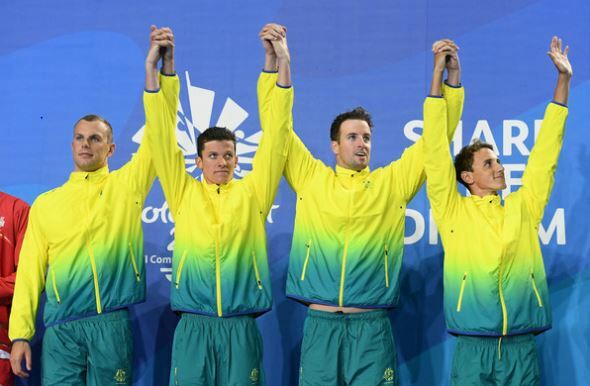 Several members of the Cartwright family were poolside at the Gold Coast to see Jack’s gold-medal winning performance, and dad Brad said it was a wonderful moment seeing Jack compete: “Such a great feeling of love, we’re so proud of him,” he said. “We’re amazed by Jack’s results and we couldn’t be prouder. It was such a huge achievement just to make the team and represent his country let alone the results,” brother Rob added. “In the medley relay where each leg is a different stroke, four swimmers compete in the heat in the morning while they rest their four main swimmers. That night they won the gold medal, just touching out the English team,” Mr Cartwright said. “Right in the middle of the pool, which is where you want to be,” Mr Cartwright said. Jack went to St Francis Catholic Primary School and Tannum Sands State High before accepting a swimming scholarship at St Peter’s Lutheran College in Brisbane in 2014 to complete year 11 and 12. “There’s four boys, Rob, Sam, Henry, and Jack, he’s the youngest. They were all swimmers, but obviously Jack’s gone the furthest of all of them,” Brad said. Coached by Caroline Hayes in Gladstone from 2008 to 2013, and winning several state and age championships as a junior swimmer, Jack thrilled the 10,000 strong Comm Games crowd with a blistering win in the 4 X 100 M Freestyle relay on Friday night along with Kyle Chalmers, James Magnussen and Cameron McAvoy. Swimming against Kyle Chalmers since he was 14, the ‘rivalry’ has been good for both swimmers’ performance: Jack stepped up to replace his injured teammate at last year’s Pan Pacs making his international debut at just 20. “All that sort of thing, long hours, morning and afternoon training, driving all over Central Queensland for meets, down to Brisbane for State Championships and all over the country for National Age championships,” he said. “He does three hours of training in the morning, three in the afternoon, and with massage and gym, if he’s not training or eating, he’s sleeping,” Brad said. “The only times we’ve been overseas, it’s to sit at a swimming complex and watch Jack swim,” he laughs. “His goal and his coach’s goal is 2020, to qualify for the Tokyo Olympics,” Brad said.